She's most recognizable in her Game Of Thrones period garb. 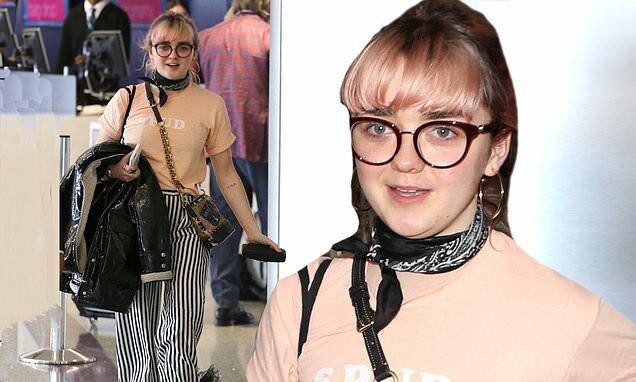 But Maisie Williams went for an altogether more modern look on Monday, when the 21-year-old actress touched down at LAX. The English starlet showed off her eclectic sense of style in striped pants and leopard print Dr. Martens boots as she exited the Los Angeles airport. The Coach brand ambassador paired her eye-catching lower half attire with a peach T-shirt bearing the word 'SPUD' across the front. She accessorized with a PVC jacket, neckerchief, cross-body bag and gold hoop earrings. Maisie rounded off her fashionable appearance by styling her pink-hued tresses into a high pony tail. It was announced last week that Game Of Thrones' eighth and final season will return on April 14. Ashley James puts on sizzling display in midnight blue silk slip She recently spoke candidly about her battle with anxiety.